When an occasion calls for luxury in abundance, this commanding collection offers a royal delicatessen's worth of imported goods. 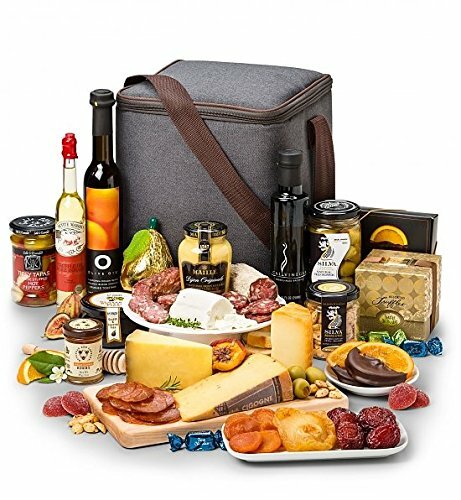 An unparalleled collection of charcuterie, imported French cheeses and gourmet pairings, both savory and sweet, served in a large tailored isothermic cooler. When the occasion calls for luxury in abundance, this commanding collection offers a royal delicatessen's worth of imported fare. Included in this Gift: Cantalet Dore, La Cigogne Elderflower Tomme, MontChevre Truffle Log, Olli Spiced Salami, Barrel Aged Balsamic Vinegar, Belgian Chocolate Pear, Blood Orange Olive Oil, Chocolate Dipped Orange Slices, Fanciful Fruits, Jamon Iberico de Bellota, Le Grand Truffles, Maille Dijon Originale Mustard, Orange Blossom Honey, Silva Red Pepper Stuffed Olives, Strawberry Pome Frais, Stuffed Peppers, White Truffle Oil, Zoe's Uncured Salami, and Petit Basque. Perfectly Marbled Iberico Ham, Quartet of Artisan French Cheeses. Stuffed Olives, Marcona Herbed Almonds, Blood Orange Olive Oil.